I’ve been looking forward to the release of this book for a year. When I started talked with David at RDP regarding the Cabbages, I asked him what book he’d like to publish, if he could choose any book on his ‘wish list’. A cyberpunk book was his answer. So, the Cabbages set about making his dream come true. 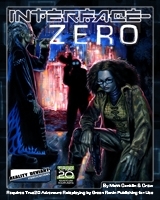 Interface-Zero is the result of over a year of development by B. Matthew Conklin III, Hal Maclean, Patrick Smith and Richard Clark (among others). Available from OBS and RPGO. This entry was posted on Thursday, August 7th, 2008 at 17:15 and is filed under Uncategorized. You can follow any responses to this entry through the RSS 2.0 feed. You can leave a response, or trackback from your own site.